We have managed to secure a very limited stock of original vintage perspex cased 50 microamp (50uA) moving coil meters, which fit the most common CDV-700 models (Anton, Lionel, Victoreen 6A/B etc, but not ENI). They are mechanically and electrically identical to the ones fitted to most CDV-700s, but they were intended for high-range meters and the dial had a different scale. However, we have developed a method to re-scale the dials with a scanned replica of the ones used in CD V-700s, so they look and perform exactly like an original meter. The conversion process minimises the possibility of dust or contaminants getting into the delicate movement, and the case is hermetically sealed after the dial is replaced. They are re-aligned and tested before despatch and should have a long and useful service life, though please bear in mind that these are vintage components and in most cases more than 40 years old, so our warranty is limited to them not being DOA when delivered. Each meter comes with an as-new (un-issued old stock) rubber gasket plus a set of brass nuts and washers for the connecting cables. In general these meters have been very carefully stored but they may have some minor surface blemishes (very light scratches, scuff marks etc.) but definitely no deep scratches or cracks. They will be very carefully packaged, and this will include the original, well-padded storage boxes, and supplied with a shorting link, to further reduce the risk of damage during shipping. We can also supply other meter related items (fixing screws, terminal solder tags etc.) Contact Us for details. 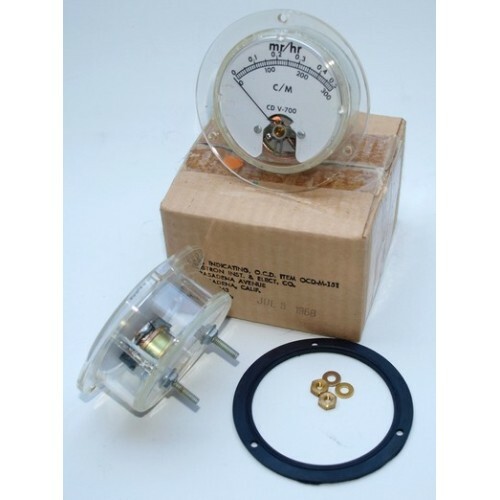 See also our meter re-bezel kit for improving the look of meters with cracked bezels.